In the digital world we live in, it’s been easier than ever to create your very own website. Don’t get me wrong, each and every website still comes with its own unique set of challenges and hurdles, but you don’t have to let that stop you. I’ve created a few sample sites for school projects, a side e-commerce project I’m working on, and of course this awesome little blog of mine! Trust me it’s so easy to abandon your website due to the overwhelming possibilities and customizations you’re faced with during the initial setup process. Well, let me give you a few steps that will help you stay focused and make consistent progress overtime! This should be your first priority before anything else! Are you trying to start a travel blog or are you trying to sell custom jewelry? Believe it or not the purpose of your site affects everything from aesthetic decisions to basic functionality. One difference that plays a large role in this is if you plan on selling products through your site. Many themes don’t support an online shop, so you want to make sure you have this portion figured out before you start designing the pages of your site. Also, you’ll most likely need a plugin or an externally linked site if you do plan on operating an e-commerce shop. This is where you need to brainstorm and collect your thoughts before starting. I’m personally a big fan of WordPress for many reasons! Not only are there so many plugins and integrations of 3rd party applications and platforms to choose from, but it’s also a fairly user-friendly platform to use. There are other applications out there such as Wix, which is another user-friendly platform that I’ve used, but it all depends on what works better for you. I’d suggest watching video tutorials of varying hosting providers to see the pros and cons of each one. If you’re trying to set up your own e-commerce shop, you might want to check out platforms such as Shopify or Big Cartel due to their selling capabilities. If you’re trying to have more customization with the familiarity of a WordPress site, look into installing Woocommerce. That’s what I’m currently using for my side project, which hopefully I can unveil soon. This is key for any brand (online or offline)! You need to have an identity so that people can remember who you are and what you do. You probably already know this, but repetition is one of they key metrics in effective advertising. I know I’m dating myself, but do you remember those obnoxious Head On commercials that they’d show on TV ten times a day? This is one of the most blatant forms of repetitive advertising I can think of, and it was incredibly effective. They were consistent, used the same slogan, and had the same color palate on every single ad. Now don’t get me wrong, I think they were at one extreme side of the spectrum, but they wanted people to remember them when they were in the grocery store faced with an aisle full of their competitors. Not only will consistent branding help your potential customers remember you, but it will also make you appear to be more of a legitimate company. Once you have your company color codes, font, and logo figured out, apply it consistently throughout your website. Now with keeping tip number three in mind, I want you to understand the utter importance of tip number four! Your website is no good if it does not work and is not easy to use. I hate to be so blunt, but it’s true. Can you imagine being wowed by a graphic designer’s online portfolio, and then the second you decide to click on their contact page it leads to a broken link? You would be frustrated and then ultimately move on to another designer’s site. Not only is this sad, but it’s losing you money and notoriety! You do not want this to happen to you. Ever. Make sure you test all pages, links, and that your site is somewhat intuitive. In today’s world people lack patience, so if your site isn’t up to par I can guarantee that they’ll move on to one that is. As I mentioned before, creating a site can be extremely daunting! Instead of overwhelming yourself all at once, take things one step at a time! There’s a reason why Facebook is constantly updating their features and layout, it’s because they change their minds about what looks good and what should take top priority. Styles change and technology does as well, so I can promise you that your site will too. Try to make small adjustments spaced out over time. You don’t want to change too much too fast if you can avoid it. Another important thing to keep in mind regarding this, is that you want to test every change you make inside and out. This will avoid any major headaches after going live with your new updates. Okay, okay, okay. I know that Google is this supreme being that we utilize on a daily basis, but without basic promotion and SEO, no-one is going to know how the heck to find your site! Try using free social platforms such as Facebook, Twitter, Instagram, YouTube, Reddit, Dribble, etc. to post about your site and any new content or products that you’ve added. There’s a fine line between being informative and spammy, but you can learn tips from any one of the thousands of articles on best practices by fellow marketers. Another helpful way to get some more search engine traffic is by adding tags or keywords to your pages and posts. I know this may seem unnecessary, but I generate a lot of traffic from tags alone. I also like using hashtags on my social posts since that draws in tailored audience traffic as well. I’ve found that hashtags work best on platforms such as Twitter and Instagram. What is one of your favorite websites and why? Shall a blog can only focus with one thing or even two-three? A lot of people have different opinions on this! My blog for example is a little all over the place, but I try to keep it centered around offering advice to fellow creatives or just life advice that’s applicable to everyone. Even though I have several topics, I try to keep my formatting and graphic design consistent. I would probably try to have no more than 5 topics that somewhat have something to do with each other as a general rule of thumb. 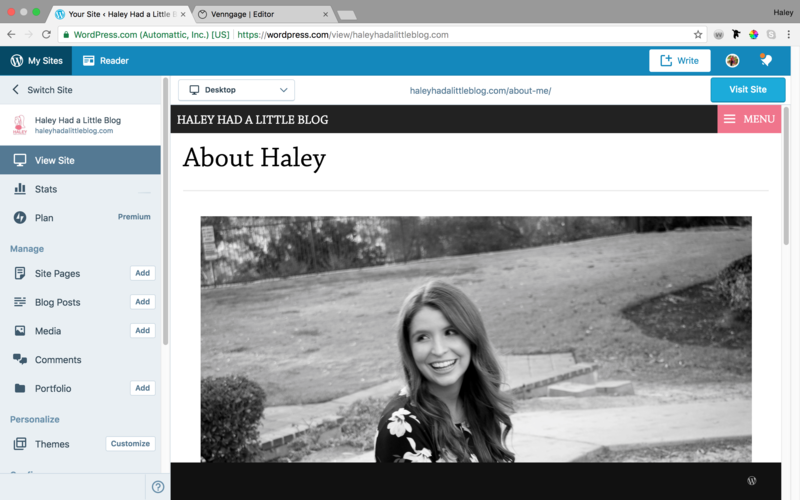 “Haley Had A Little Blog” is my favorite. For shopping I like QVC !